After growing up with the pleasures of helping his father milk cows and herd sheep on a farm in the Manawatu, the founder started selling machinery in 1966. 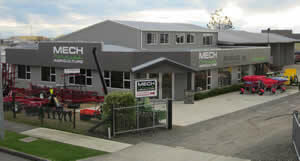 Today, still owned by the same family (100% New Zealand owned), and still with the same integrity, reliability and excellent service that farmers have grown to appreciate and trust, Mech Agriculture has grown rapidly as a first-rate supplier of machinery and parts. Mech Agriculture are here to help farmers $ave time and money on the farm while boosting production, due to efficient, effective machinery. Used? New? Hire? With access to a broad range of products for behind your tractor or ATV, we will discuss your options to ensure you are getting the best machine for the job. That's not all - with Mech Agriculture, you get top after-sales service and support, plus access to a vast range of parts. We stock quality New Zealand made products, as well as known and trusted overseas brands. Mech Agriculture is highly regarded in the industry and sought after by farmers all around New Zealand. Our own specialised workshop does setup and repair work. All this, plus the bonus of a central location (in Palmerston North), means we can continue to excel expectations through high quality workmanship and on time delivery. To assist clients in maximising their yield by providing solutions that exceed expectations. To build trust based on our core values - integrity & efficiency. We are committed to elevating employees, and educating the oncoming generation. Need the machine now, but can't afford the capital outlay? You'll enjoy the Mech Agriculture experience - and we look forward to welcoming you as a valued customer.